We’d love your help. Let us know what’s wrong with this preview of The Age of Genomes by Steven M. Lipkin. To ask other readers questions about The Age of Genomes, please sign up. Biotechnology, Synthetic Biology, Genetics, Personalised Medicine etc. Dr. Lipkin makes several points in this book with some points being made more forcefully than others. (2) Eugenics is a "bad" word these day Dr. Lipkin makes several points in this book with some points being made more forcefully than others. (2) Eugenics is a "bad" word these days but he does cite the remarkable work of Jewish organizations who aim to wipe out Tay-Sachs disease by appropriate, advanced screening. That work has been remarkably successful at decreasing the number of children born with Tay-Sachs disease so maybe there is some middle of the road approach where we put an end to conceiving children with devastating diseases by advanced knowledge of the genome of the conceiving couple. Further, pharmaceutical companies are reaping handsome rewards for developing therapies for rare diseases. Perhaps a more cost-effective way of attacking those rare diseases is to use modern advanced reproductive techniques (which costs a fraction of therapy costs) to avoid the birth of a child with a rare disease in the first place. Dr. Lipkin, who is Jewish, acknowledges that this concept will have to be vetted pretty seriously before being enacted on a grand scale. (3) Maybe it's not a bad idea if all of us (or babies who are being born now) be genomically sequenced instead of having heel sticks for certain congenital diseases (e.g., phenylketonuria, etc.) shortly after being born. He makes these points in his book which is essentially a chapter-by-chapter interesting anecdote of genetic patients that he has treated over the years. If you want to find out how genetics/genomics is performed, then there isn't enough information in this book to get you there. This book is much closer to an "I had a patient once who...."
That's not intended to be critical or condescending. There's all kinds of interesting stuff to ponder in these stories and this is a changing area. I will acknowledge that he practices in a new and "interesting" field of medicine that wasn't really available to someone who graduated from medical school much earlier than the mid-1990's. This book is a series of chapters that each contain a story about someone with a medical issue. Usually the illness has a genetic basis which Dr. Lipkin uses as a starting point to explain some aspect of genetic medicine. The best part of the book is that he brings out some of the problems with being able to sequence anyone's genome. So often knowing more about genetic defects just gives a person more things to worry about. Eventually all this knowledge will surely bring better treatments, but f This book is a series of chapters that each contain a story about someone with a medical issue. Usually the illness has a genetic basis which Dr. Lipkin uses as a starting point to explain some aspect of genetic medicine. 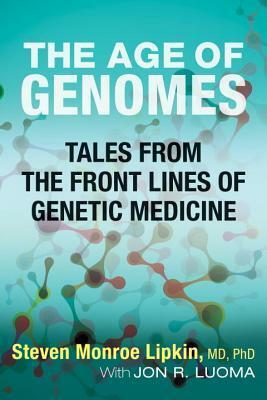 This book is a collection of "tales from the front lines of genetic medicine". The author discusses what is possible and not possible with current genetic technology. He also discusses some of the ethical issues of this technology. This book is set out in a conversational tone describing case studies, with limited science or technical discussion. In short, interesting if you haven't read much on genetics, nothing new if you have. Good accessible resource for understanding impact and application of genomic data. I am a cancer communicator; it's my job to distill and disseminate complex science. That said, I was gobsmacked by how well the authors covered this topic. They made it easy to understand, totally engaging and a joy to read. Instead of stuffy science, it was personal - through patient stories, and insights into the personality of the good doctor himself. The writing was fantastic as well - so many clever turns of phrase, and a little humor. I actually found myself laughing out loud in some place I am a cancer communicator; it's my job to distill and disseminate complex science. That said, I was gobsmacked by how well the authors covered this topic. They made it easy to understand, totally engaging and a joy to read. Instead of stuffy science, it was personal - through patient stories, and insights into the personality of the good doctor himself. The writing was fantastic as well - so many clever turns of phrase, and a little humor. I actually found myself laughing out loud in some places. The book covered a wide range of topics touching genetic medicine: the science and history of the technology as well as policy, ethics and individual considerations. There were also plenty of explainers of specific diseases (cancer and beyond). I learned a great deal, and was left with plenty of food for thought. What started as a read for professional purposes ended up a personal pleasure. This book"The Age of Genomes" tales from the front lines of genetic medicine which is a relative new concept is a very interesting read.I found that this world of DNA and what it represents is astounding and fascinating start to what could be both positive and negative in the world compared to the nuclear physics of the last century. I would like to thank the author and goodreads for this chance to read this book.Its a complex one and would like to re read it again soon.I enjoyed this book and fe This book"The Age of Genomes" tales from the front lines of genetic medicine which is a relative new concept is a very interesting read.I found that this world of DNA and what it represents is astounding and fascinating start to what could be both positive and negative in the world compared to the nuclear physics of the last century. I would like to thank the author and goodreads for this chance to read this book.Its a complex one and would like to re read it again soon.I enjoyed this book and felt that what the authors gave us by bringing together stories of patients and how this can affect the changes in their lives. My girlfriend is a genealogist so DNA testing and anything that helps to map ancestry is totally fascinating to her. I on the other hand just enjoy the idea of advancing science and having a better understanding of who we are as beings. DNA is probably the biggest most important piece to our human being puzzle. Interesting read, although admittedly, at times it was over my head. I was surprised on how well the author covered this topic. It is easy to understand, engaging and a joy to read. Instead of stuffy science, it was personal - through patient stories, and insights into the personality of the good doctor himself. Several interesting and lightly connected essays on the world of genetic research. Lovely to read a book that is very up-to-date (there was even a reference to the late David Bowie). As a snapshot of the science, it's worth reading. In five years, the book won't be as meaningful. Well-written, easy to understand and I learned a lot!